BlackBerry Bold: I’m going to try and use barry to back up and synchronize my Contacts, Calendar and Notes databases. I’ll have several backups in case anything goes wrong. Logitech MX1100 mouse: The default Logitech SetPoint software includes options for changing DPI/resolution and extra function buttons, including the side “gripper”. It’s currently mapped to Expose on my MacBook, and I hope to convince X.org to work without adding new drivers. 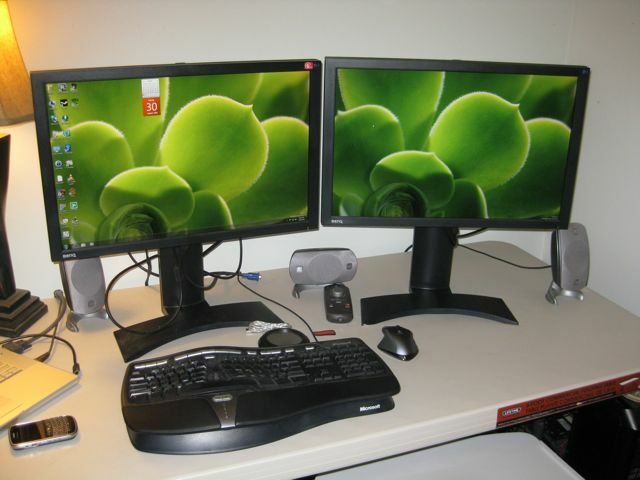 2x BenQ FP241W monitors: Both have a native resolution of 1920×1200 at 60Hz – this is absolutely essential. The two will need to provide a seamless left-to-right desktop like they do under Windows. Logitech Z-5300 speakers: The 5.1 surround output is routed over three stereo mini-plugs – front stereo, rear stereo and subwoofer. Ideally I can convince the sound driver to perform audio mixing. Most content I listen to is stereo only; the speakers have an option to upmix this content but it will be a good test to see how audio processing compares under different operating systems. Finally, the USB coffee cup warmer in the center of the picture is the key to the whole operation! Hope to be writing my next post from a fully installed system – if I get that far! A trip report will be forthcoming. The cup warmer is obviously the most important part! 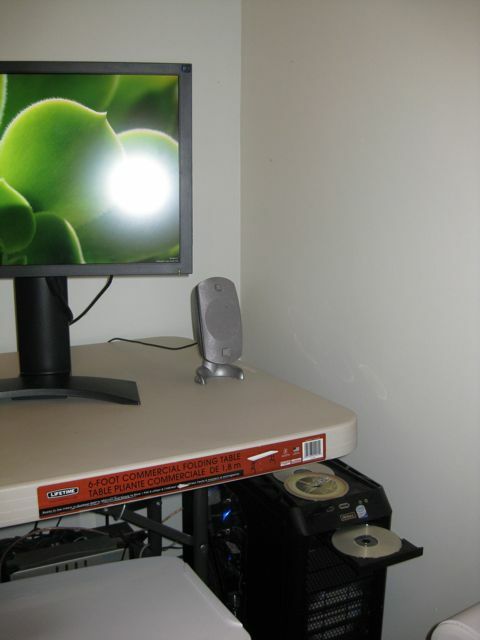 I am immediately jealous of your setup. Damn you and your photographs.